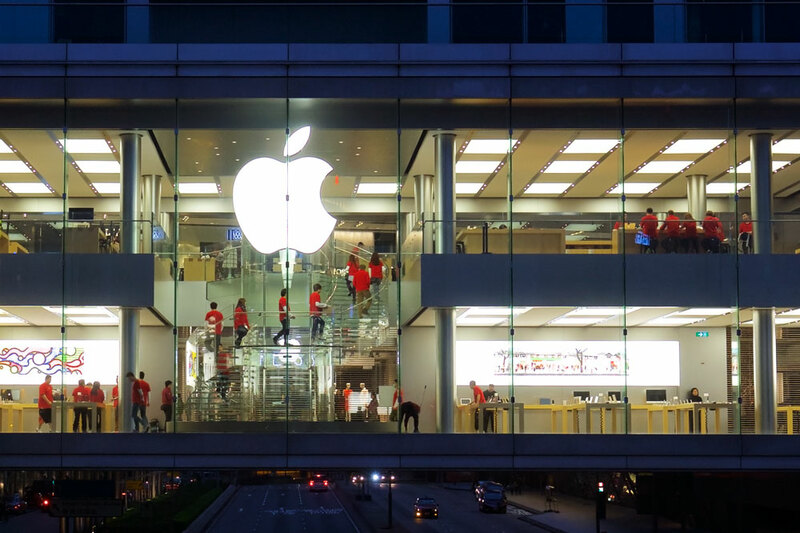 On 19 February, Chinese New Year’s day, Angie and I walked past the Apple store in Hong Kong’s IFC mall. 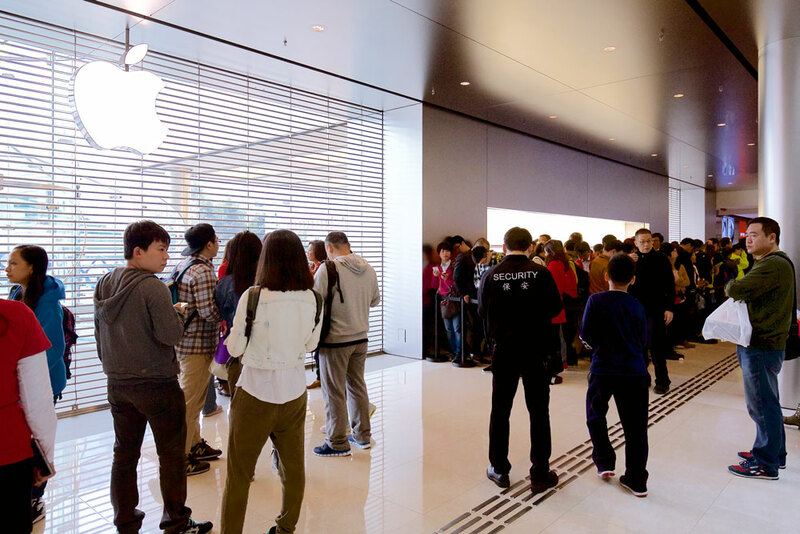 It was just before 11AM (opening time) and we saw a few hundred people lining up outside the store. We assumed that there must be something special going on, so I approached an Apple store employee and asked what it was. No, she said, this was a typical day. 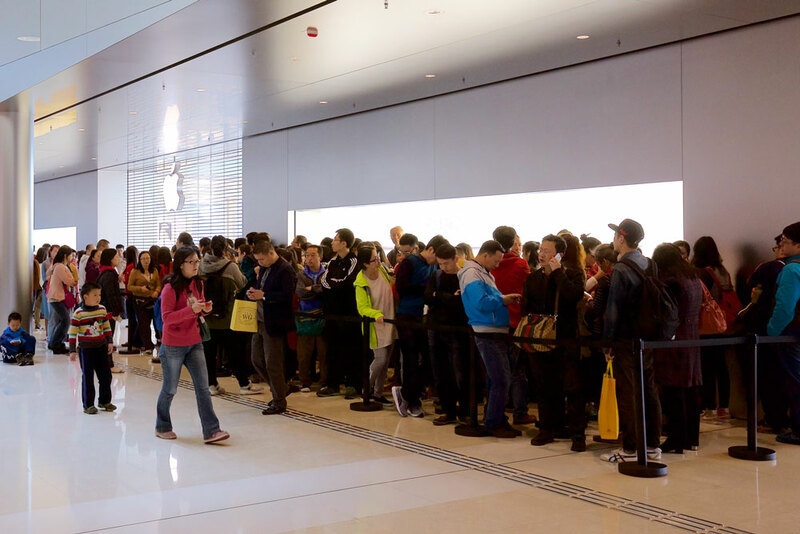 People were lining up to buy the iPhone 6. She called it “in store reservation.” I think they use this language because on most days they run out of stock before everyone in the line gets a phone, and the unlucky people still in line get to reserve their phone of choice. Presumably they get to jump the queue the next day. Inside, the line hugged the interior wall almost all the way around the store. By routing the line this way, the store could operate normally even as a couple of hundred people were lining up for iPhones. The line inside the store is best observed from the outside. 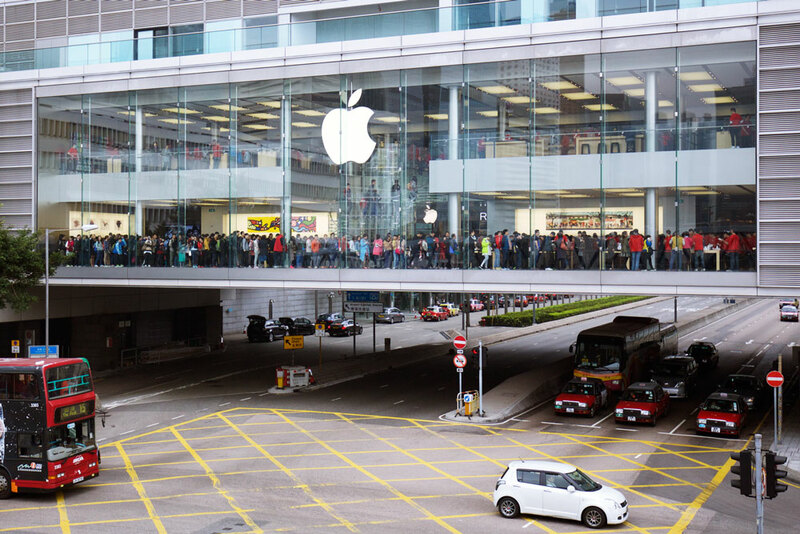 All of those people against the window below are hoping to get their new iPhone 6 today. A few hours later we walked past the store again. There were now waiting areas on both sides of the store entrance. The one on the right fed into the store and was throttled by a few redshirts1. When the waiting area on the right was empty, redshirts formed a human corridor to allow people to move from the waiting area on the left to the one on the right. I talked to a second redshirt who confirmed that yes, they sold out their stock on most days, and yes, it has been like this since September. It struck me how upbeat and happy all the redshirts were. It’s clearly a lot of fun selling hotcakes. Later that evening we happened to walk past the store a third time on the way to the Star Ferry. It was just after closing time and only the redshirts remained, busily preparing for the next day’s inevitable repeat of the most orderly frenzy I have ever seen. Just think about that. 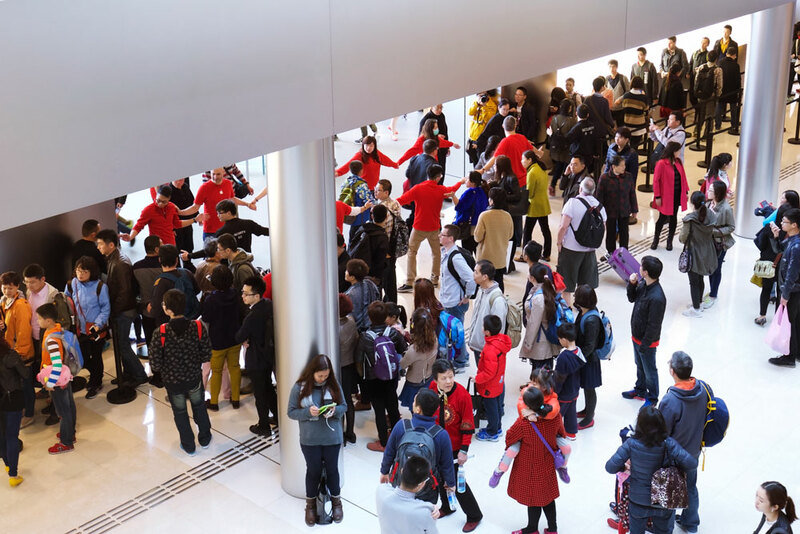 Five months after launch the Apple Store in Hong Kong serves the kind of demand for the iPhone 6 that any other company would be thrilled to receive for a product on launch day. And they see this demand every day. Here are a few related things about the iPhone in Hong Kong: First, you see smartphones in use all the time — more so than I notice in US cities. People are mostly messaging, playing games and watching streamed shows. A very large proportion of the phones you see have large screens (5″ and up). And you definitely see more Samsung phones than iPhones. 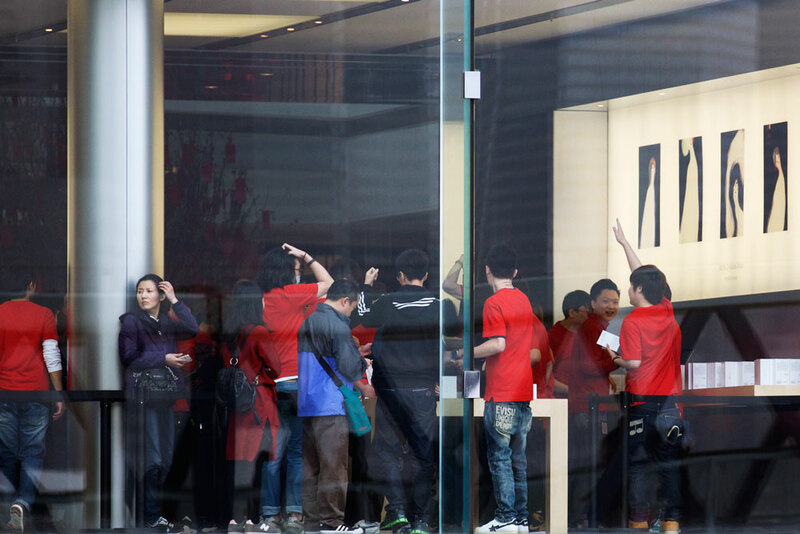 But if the activity at the Apple Store is anything to go by, that’s not going to be the case for long. 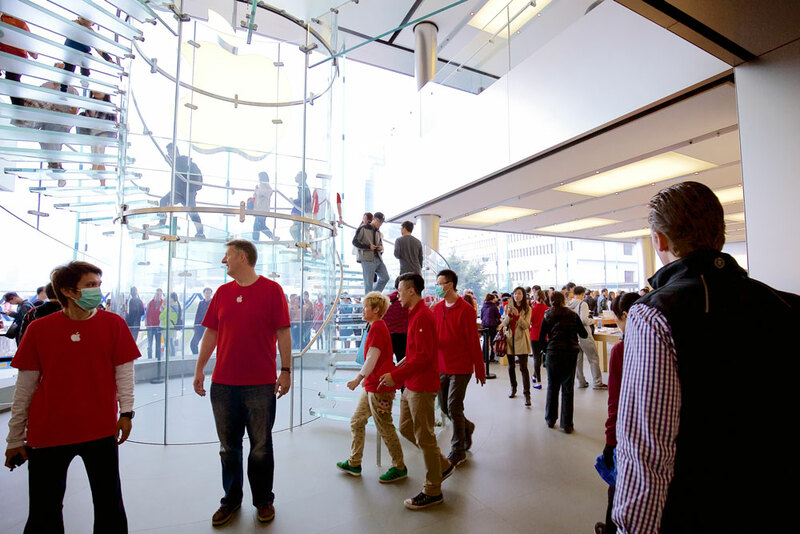 The Apple Store kind, not the Star Trek kind.